Today's post is brought to you by the letter "F"- for fun! There is nothing else very educational about this post and it is certainly not about reading or writing. Summer is about having fun, though, and this was a lot of fun! It also kept two highly energetic little boys entertained for a long time, so I thought it was worth sharing. 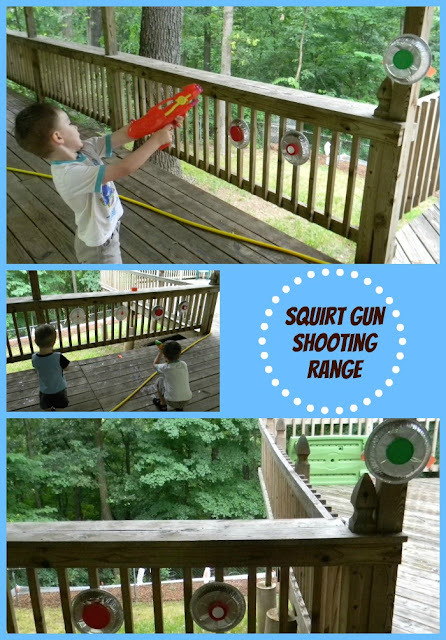 One day last week, our rainy day fun turned into a squirt gun shooting range! The boys had a lot of energy and needed to get outside despite the rain. After about 10 minutes outside, however, they were ready to head back inside. I had not wasted two sets of wet clothes on 10 minutes outside play, so I had to think quick. I saw some pie pans in the basement that I had been planning to use to make stepping stones for a garden. I think they are called "disposable" pie pans-- but since my mom still uses the set she bought back in the 80s, let's call them "reusable" pie pans for her sake. As I was trying to think up something to entertain the boys, I suddenly saw targets on them... on the pie pans, not the boys! I quickly raided our lid stash and used duct tape to secure the lids to the pie pans, making a target. To make the squirt gun shooting range, I taped the pie pans to our deck. I think trees or fences could work as well. Then we stood back and shoot. Well, some people didn't like the stand back idea! After refilling the squirt guns a few times, the novelty of the shooting range began to wane. To see if I could reinterest the boys, I decided to create some paper plate targets. I thought they would be better able to see where they had shot on the target with a paper plate. I also added point values. If your kids are as competitive as mine, make sure you add point values. They were racking up 1,000s of points! For added fun, we tried using some water dyed with food coloring too. I don't think our water was colored enough, but if you can get it dark enough, it could be fun. Maybe each kid could have their own color? I hope you are taking time with your little ones to enjoy the summer. I'm off to another shoot out at the squirt gun range! Cute idea! Drew will love this - I'll have to pin it. I made a bulleye out of chalk for him on our fence but this is so much more fun! So cool, and I have found that it is nearly impossible to have fun without learning or developing a skill. What about developing hand strength, and hand-eye co-ordination? You just can't go wrong! And my buddies would LOVE this activity! Great idea, Jackie! Sometimes the best ideas come when we are desperate! How totally fun! Very good idea!